So April has kicked off with a bang for all it seems. Cricketing action in the first week, now IPL has begun & it is going to be an awesome month. It was an awesome month of March for us because as I said in the Traffic Stats posts we were able to write almost a post/day. It felt so good to regain my writing habit thanks to some time management tips from various blogs that I read. We covered exactly 23 posts in the previous month mostly related to Blogging and WordPress tutorials. So let’s get on with the Wrap-up. 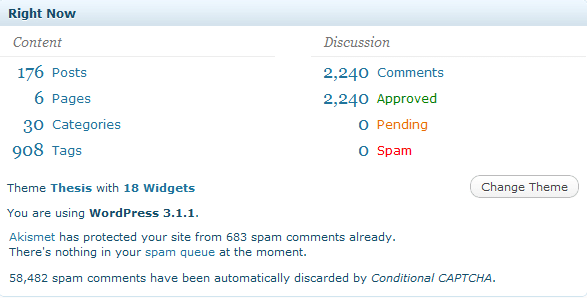 We crossed 2000+ Comments mark by the end of March. Thanks to each and every commentator & reader for your continued support. It really inspires more to write some killer HowTo’s and share my knowledge with you. Note : The above Wrap-up also includes Guest Posts from our lovely guest authors. If you want to start writing for us then, refer the ‘Become A DailyBlogger’ page for details & guidelines. You can Subscribe to our posts via our RSS Feeds / Daily Updates. Should I continue to write more on niche topics ? Did you really like the posts that I and my guest authors wrote in the previous month ?? Next PostTargeting SEO : By Language or By Country ? As i ddidnt visited your website for one or two weeks i could not read your articles, Anyway this wrapup will surely help me, Hope i would make most out of this wrapup!! I actually very much interested in knowing new SEO techniques. I really like them. Lovely posts in the past month, some of them are inspiration while others are informative! I also love those SEO articles just like Kavya Hari! Good going Mani. BTW, I really liked your footer widgets for capturing the posts category wise. Looks quite nice.